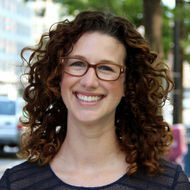 Emily Robichaux serves as Groundswell's Director of Project Finance and Product Development. She coordinates with investors and financial partners to finance community solar projects that deliver both financial return and community impact. Emily also works with Groundswell's customers to design products, systems, and services rooted in transparency and respect. She is committed to finding scalable business solutions that make the clean energy market and products accessible to everyone. A native of Baton Rouge, Louisiana, she has lived in D.C. since 2005.